Something I've always been very self conscious of is my teeth/smile. I wasn't blessed with the best set of teeth and after a couple of years of some badly fitted braces, they just haven't improved since I was a teen. In the nest year or so I definitely want to look into fixing my teeth and getting those odd ones straightened up and having a nice even smile. But until then, I've been using some at home treatments to improve the aesthetic of my teeth - making them whiter and brighter! I've been trying out some products from the Nano range from WhiteWash Laboratories to see if they could improve my teeth. I'm actually very sceptical about at home treatments, but felt a lot more at ease after learning that the Nano range is actually formulated and developed by UK dentists! It's so important to use products from a brand you trust, and have put a lot of knowledge and research into developing products like these. 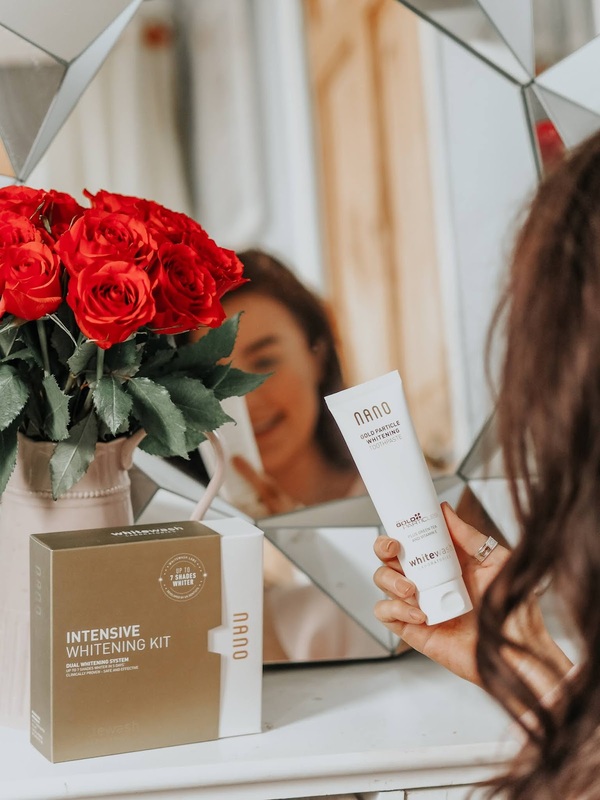 The two products I've been using are the Nano Intensive Whitening Kit, and the Nano Gold Particle Whitening Toothpaste, which is a brand new addition to their range! This handy little kit contains a two week supply of whitening strips for both your upper and bottom teeth, and a one week supply of their whitening trays. The whitening strips are super easy to use as you simply apply them for only an hour a day, meaning you can still get on with your day to day life! I usually apply these on an evening when I've finished work and I'm getting cosy in bed with my latest Netflix binge.. a couple of episodes and I'm done! After you're done with the strips, remember to rinse your mouth with water to remove any excess gel. Once you've done the 60 minutes with your whitening strips, it's time to move on to the mouth trays. These might look complicated, but the instructions in your kit will break it down step by step for you, making it a lot easier than I first expected! The trays are to be left in for 35 minutes. 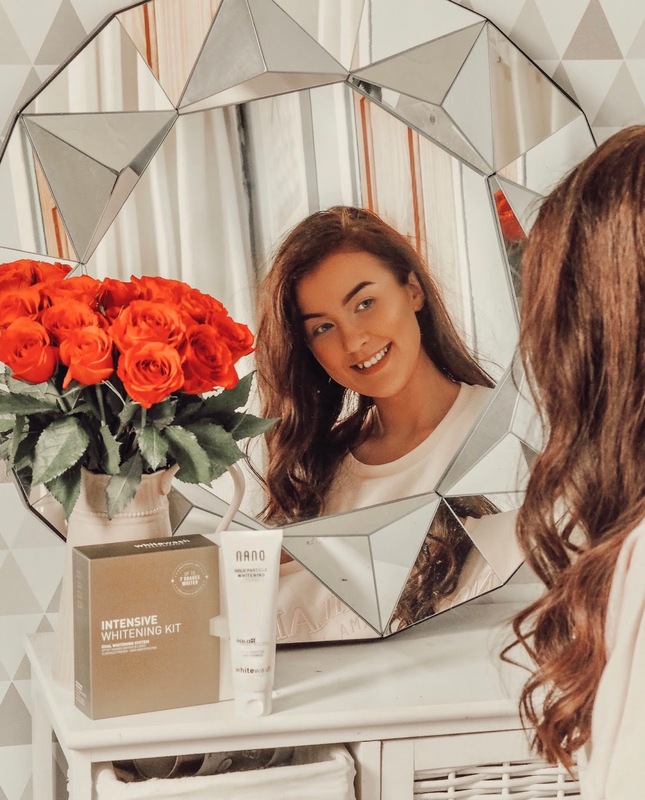 Using other products from the Nano range alongside their kits is said to give you the best results, so this seemed like the perfect time to try out their new Gold Particle Whitening Toothpaste! This premium toothpaste includes ingredients such as Gold Particles, Green Tea, Vitamin E and special Micro-Polishers to restore your teeth's natural whiteness to keep them looking as bright, white and as fresh as possible. I've been using this in place of my regular toothpaste, and other than my teeth looking incredible, I've actually noticed that 'fresh breath' feeling as lasted a lot longer than usual. It is quite a stronger mint taste than other toothpastes I've tried, but personally I love that, it makes my mouth and teeth feel extra squeaky clean! The Gold Particle Whitening Toothpaste will have 20% off for the initial launch week, as well as 15% off the rest of the website. Now to big question is 'Did they make my teeth whiter?'. According to Nano, after only one application you can notice a difference of up to 3.6 shades whiter! And like most of you, I really wasn't expecting those kind of results.. but I was actually blown away by the results! After one application, I could definitely see results. My teeth looked amazing, and more importantly noticeably whiter! What impressed was me, was how naturally white they looked though. I was worried they were going to look gleaming white, and I wasn't looking to blind anyone! *This post is sponsored by WhiteWashLaboratories. All words and opinions are my own. I've not heard of Nano but if their products work it's certainly worth looking into just for the results. I'd love whiter teeth. P.S. That mirror is stunning, totally off topic I know but I just had to say it! I've been looking into some teeth whitening products lately, so I may give these a go! your smile looks lovely, I've always wanted to try teeth whitening products! I really need to try these, after one application thats great! They sound brilliant, I love the sound of them.